Update: At about 6:40 p.m. Eastern the student group sponsoring the event posted on Facebook: "In order to comply with the institution’s request that we represent multiple viewpoints at this event we have decided to postpone. Sorry for the inconvenience we look forward to continuing this dialog beyond Facebook." "The promotional materials associated with this event were outrageous and offensive to the Catholic character of our university. The way the event was promoted is not acceptable as it denigrates Catholicism and the materials should have never been approved. The event will not be taking place this evening and the students involved in the planning will be looking to include additional viewpoints and perspectives before seeking to reschedule it. "Our understanding is that the students will be removing the flyers posted or otherwise placed around campus. Additional measures will be taken to prevent such materials from being distributed on campus in the future." 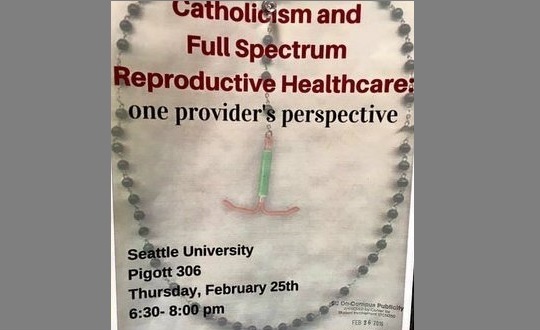 An unofficial student group at Seattle University is hosting an on-campus event this evening on reproduction and healthcare that will feature a Planned Parenthood employee, and flyers of the event posted around campus include a sacrilegious image of a Rosary with the crucifix replaced by an intrauterine device, a type of hormonal contraceptive inserted into the uterus to prevent pregnancy. The event, “Catholicism and Full Spectrum Reproductive Healthcare: One Provider’s Perspective,” is hosted by Seattle Nursing Students for Sexual and Reproductive Justice (Seattle NSSRJ), an unofficial group of graduate students at Seattle University. In the image of the distressing flyer provided to The Cardinal Newman Society, a stamp of approval from the Center for Student Involvement is visible in the lower right hand corner, indicating that the flyer was approved by the University to be distributed on campus. Following inquiries, the Newman Society was informed that the flyers would be taken down, however, the event itself will still take place in the University’s Pigott Auditorium, according to the executive dean for graduate education at the University’s College of Nursing. “That this image featuring the desecration of the Rosary was produced and distributed at a Catholic college is just outrageous,” said Morana. “Please consider joining fellow pro-life Catholics at Seattle University to provide a much needed voice for the Church’s teachings surrounding life issues. An authentic Catholic perspective is seldom heard at SU and we need your help,” the description reads. “The poster is indeed disturbing,” said Dogero. “We intend to file a complaint with Campus Ministry, Student Government and Student Involvement. We will also seek to place an op-ed in the school newspaper, the Spectator. ”Students for Life of America (SFLA) released a statement on the issue this afternoon, encouraging pro-lifers to contact Seattle University’s president, Father Stephen Sundborg, and urge him to cancel the event or ensure that a Catholic perspective on women’s healthcare is arranged. Despite the group’s unofficial status, they still seem able to host events on University property, regardless of whether those events include Catholic teaching on crucial life issues. The Newman Society asked the Center for Student Involvement how an unofficial student group was able to secure University space for the event and whether events had to meet any protocol in order to be approved, but no response was received by time of publication. Additionally, the group is hosting another event on Seattle University’s campus called “Miscarriage of Medicine: The Growth of Catholic Hospitals and the Threat to Reproductive and End-Of-Life Care” on March 4 in Pigott Auditorium. The Facebook page for the event features an image of a cleric wearing a surgical mask and gloves. “Religiously affiliated hospital mergers in Washington are threatening access to reproductive and end-of-life care,” the Facebook event description reads. The event will feature Judy Bendich, a former ACLU Washington State Affiliate President and retired attorney. The Cardinal Newman Society reached out to University President Fr. Stephen Sundborg and University Provost Dr. Isiaah Crawford to inquire about why the University is allowing the Seattle NSSRJ event on campus, and whether steps would be taken to prevent Seattle NSSRJ from utilizing campus space in the future, but no response was received by time of publication.